I am off the charts proud of my 13 year old daughter Laurel! The two of us have been running together for the last six months or so. One of our goals was to run the Autumn Woods Classic 5K this October. The AWC route is a pretty tough course with a lot of hills…not a fast/flat course. Not a course that you would ordinarily choose if you are gunning for a personal record (PR). The race was this morning. Laurel’s goal was to run in the 28 minute range. Her previous official PR was around 29:30, but she had run this route on a training run with me in about 28:30, so she knew it was possible. She crushed her previous PR. 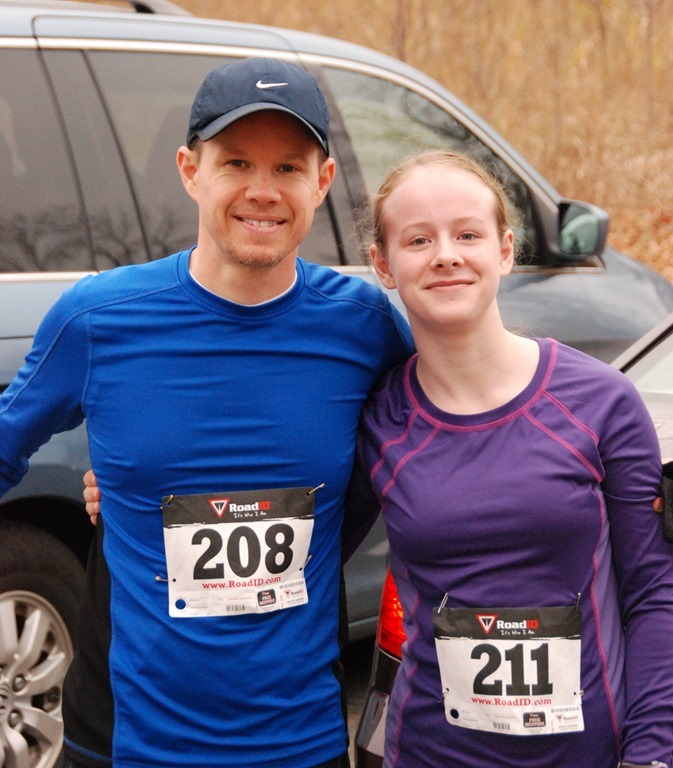 Her time was 26:10…which was fourth place in her age category (93rd finisher out of 547 total)! As her Dad and her “coach” I simply could not be more proud of her. I can’t stop smiling. I was expecting in the 28 minute range…and was completely shocked when she came across so much faster. I watched her “kick” at the end of the race…she dug deep to sprint out the end…it was very impressive. My goal heading into the race was to finish in under an 8:00/mile pace (24:49). I met my goal by finishing in 24:25 (55th overall). As far as I can remember, that is a PR for me as well. VERY cool that we both hit personal records on the same day! This time next year, I’ll probably be fighting to keep up with her! BTW…a big thanks to Tim Benjamin for coming out this morning and taking pictures of us before, during and after the race! Tim actually ran out on the course to take shots of us with about 3/4 mile left in the race. Then he kept running ahead of Laurel and taking shots of her over the last leg of the race. We got some awesome shots out of that.